Radical nephrectomy and nephron-sparing surgery represent the surgical procedures applied in renal oncology. The resection of part of the kidney or of the whole kidney parenchyma determines evident change in the retroperitoneal anatomy and in the abdominal and retroperitoneal organ relationship. 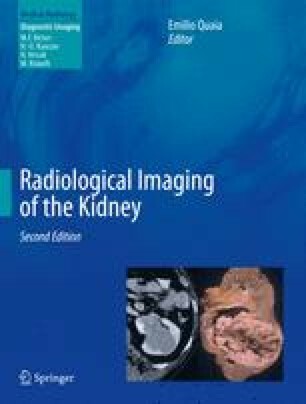 In this chapter, the normal imaging findings and the fundamental complications after renal surgery detectable by imaging are described. Moreover, the topic of tumoral recurrence and the differential diagnosis between tumoral recurrence and normal postsurgical findings is addressed.